Bible Society of Zambia (BSZ) former Translations and Media Officer Perdita Chenjela Friday staged a solo demonstration at Bible House against Zambia Police (ZP) failure to inspect or confiscate a gun her former boss BSZ General Secretary Evaristo Mambwe used during her assault on 9th February, 2011. But her protest was interrupted three times by plain clothed police officers. The two Zambia Police conversant with the matter and known to Mr Mambwe went to Mr Mambwe’s BSZ office before engaging Ms Chenjela who they asked to discontinue her protest and follow them to Millennium Police Post which she objected to. At that point, the police claimed Ms Chenjela’s cameraman Mpundu Chenga had photographed them. They inspected all the photos on Chenga’s camera even if they realized there were no photos of themselves and still took Chenga to Millennium Police Post and could not release him and the camera, for about two hours, without follow up and support. Mr Mambwe was for most of the day in his office for the solo demonstration from 10:00 to 15:00. 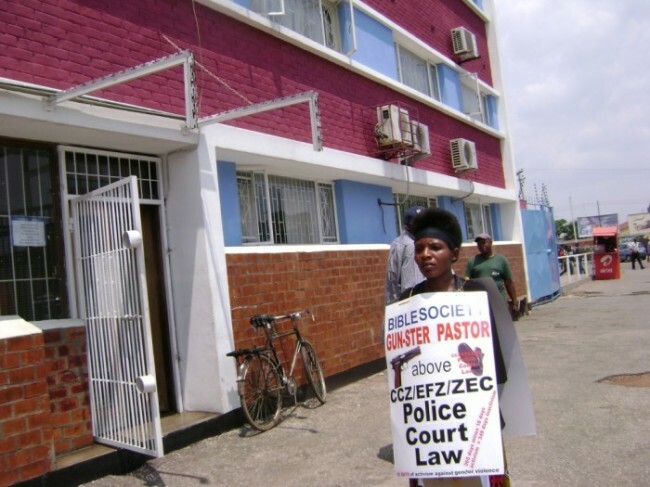 Newton Lungu & Associates Managing Partner, is BSZ board Chairman whom Ms Chenjela petitioned about the miscalculation and Pastor Mambwe violent language before Small Claims Court (SCC) case and ruling in August 2011. (7) for mismanagement and running down Bible Society for betraying donor and member confidence.